Pursuing the Leading Edge in Medical Device TechnologyThe JACLaSGoal:toadvance the state of the art in clinical laboratory testing devices for a healthier tomorrow. Oct. 17, 2018 newJACLaS EXPO 2018 Reports on attendees was posted. May. 08, 2018Members of JACLaS was posted. Sep.25, 2017JACLaS EXPO 2017 Reports on attendees was posted. Sep.06, 2017Information of "The Best of AACC" was posted. Jul. 25, 2017EXHIBIT INFORMATION & EXHIBITORS LIST of JACLaS EXPO 2017 was posted. Sep.1, 201 06 EXHIBIT INFORMATION & EXHIBITORS LIST of JACLaS EXPO 2016 was posted. May. 20, 2016Members of JACLaS was posted. Mar. 01, 2016Members of JACLaS was posted. Apr. 14, 2016Application to JACLaS EXPO 2016 started. Aug. 24, 2015EXHIBIT INFORMATION & EXHIBITORS LIST of JACLaS EXPO 2015 was posted. Mar. 24, 2015Application to JACLaS EXPO 2015 started. Jul. 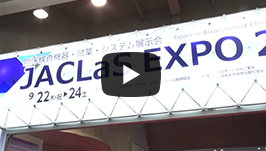 22, 2014The Information of JACLaS EXPO 2014 was posted. Sep. 20, 2013The Information of JACLaS EXPO 2013 was posted.